It’s my job to know the ins and outs of fashion—from the current trends to styling tricks and the best products on the market. But even I—a fashion-forward editor—can find myself stuck in a fashion rut now and then. I have a closet overflowing with clothes, yet I have nothing to wear! And this may just be the fifth day in a row I've worn high-waisted jeans and a white T-shirt to work. Anyone else with me? Craving a little sartorial pick-me-up, I tapped into Glamhive—a personal styling hub that gives you access to some of Hollywood’s top celebrity stylists. “Just like how you need a blowout, a manicure, or that spin class after work—all it takes is someone who can help you take yourself to the next level. By having access to a personal stylist, you now have someone who will take care of you, and bring out your best self,” says the Glamhive site, summarizing its philosophy of democratizing personal styling. What's cool is that the whole process is online so anyone who wants fashion styling tips, whether it’s for a special event or simply new outfit ideas for work, can have access to a stylist no matter your zip code. So now that I've found the blow dry bar of personal styling, how does it work? 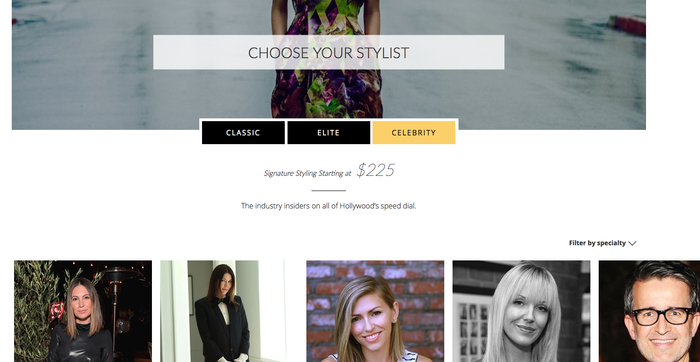 On Glamhive’s website you have the choice of several amazing celebrity and personal stylists. You can fill out a quick questionnaire with your details, budget, and service you're interested in, and Glamhive will match you with a stylist, depending on your needs. I was matched with Jennifer Rade, costume designer and celebrity stylist to A-list celebrities such as Angelina Jolie, Rumor Willis, and Jennifer Love Hewitt. You'll then be sent a quick questionnaire on your style preferences and you'll share some info on celebs and fashion icons whose style you admire. Your stylist will then schedule the first part of your makeover, which is the closet detox—a Marie Kondo–esque examination of your closet. I was pleasantly surprised to have this step as part of the fashion makeover, but I now understand why they do it and how important it is to assess what you already have in your closet in order to make dressing every day infinitely more fun and easy. Organization really changes your outlook and approach to dressing. This whole process is done over Skype or FaceTime with your stylist. Jennifer called me and we went through practically every aspect of my closet—from examining my hangers (they should all be facing the same way and preferably all the same type, just FYI; these velvet Amazon ones are apparently the best). We also examined what clothing I wear on repeat and love the most and what I basically never touch. Turns out, I had several clothes that still had the tags on and I hadn't even realized. Oops! After cleaning out my closet, I focused on items I wanted to take to the next level—for me this meant elevating my current basics I practically live in—my jeans and white tees. I also wanted to gain some direction with styling items that I love but never wear, such as my cream corduroy skirt, and a silk lavender floral-print dress. My main objective was to add some variation to my everyday work outfits, build upon the basics I already own, and zhuzh up my neutral-loaded wardrobe. After our detox, Jennifer promptly sent me mood boards and product suggestions to help me build upon some of the basics I already own as well as tips on how to style that skirt and dress I never wear. Her suggestions included adding some bold color to my jeans and tees in the form of a bright blazer, playing with layering techniques, and integrating some cool shoes and accessories that instantly change the look of an outfit. I really loved the encouragement to get out of my comfort zone in my day-to-day dressing. I learned that a pop of color can be really powerful, and the right shoes can take an outfit from zero to 100. I also learned that organizing my closet is key to staying excited about my outfits. If it's a workout to pull back the hangers to find clothes in my closet (which it really used to be), then I'm not going to enjoy the art of getting dressed. Luckily, by spring-cleaning my wardrobe, I can now focus on the items I really love and I have clarity when it comes to getting more playful with my looks. Scroll below to see the before and after of my celebrity styling session with Glamhive and shop the looks. Another day, another jeans-and-white-tee ensemble. Jennifer suggested a bold pink blazer to jazz up my staple jeans and white tee, which—as someone who doesn't wear much bright color—was a little daunting, to say the least. But I found the statement piece really took the look to a whole new level, and not only did it incite a plethora of welcome compliments, but it also boosted my mood as soon as I put it on. We added strappy sandals and of-the-moment necklaces to finish the look. Jennifer brought to my attention that the reason I had never worn this dress (it still had the tags on) was because it is ridiculously sheer. (Yes, she could see that over FaceTime.) And she was dead right. She suggested a basic slip to put underneath it—an item I've never thought of buying before but now realize it's a handy staple to have in my arsenal. We paired the dress with fun white slouchy boots and an oversize white denim jacket to give the feminine dress an edgy touch. Apparently, all my corduroy skirt needed was a little enlivening with a striped tee, this season's trending tall cream boots, and a simple pendant necklace to finish the look. Up next, I tried on 20 pairs of straight-leg jeans to find the best fitting.